After the death of his mother and the end of his father s high-powered career, Zach and his Dad have come to the north of Scotland to live rent-free in Grandfather Alistair s cliff-top cottage. Dad asks Zach to clean out the old garden pond, a rotting nightmare where not even a tadpole can survive. But when he drains the pond, he unearths something unexpected a trapdoor leading down into darkness... He ventures down there and discovers something amazing a glowing egg-shaped stone. Once brought back to the surface, Zach s run of bad luck seems to change entirely. Suddenly, he can't seem to stop winning and even Dad s career is unexpectedly back on track. But good luck can't last forever... The stone belongs to a race of ancient creatures that dwell deep beneath the ground - and they want it back. Pretty soon, unspeakable things begin to claw their way to the surface in search of the stone and for Zach and his new friend, Pepper, there's one all-important question. Can they stay alive until morning? Mr Ripley's Enchanted Books will be ten years young this year. When I started blogging many years ago, Philip Caveney was the standout author for me in 2008. I absolutely loved all of his books, especially the Sebastian Darke series which particularly made me laugh. Every book since, I have absolutely loved and enjoyed with equal measure. So Danny Weston, watch your self. 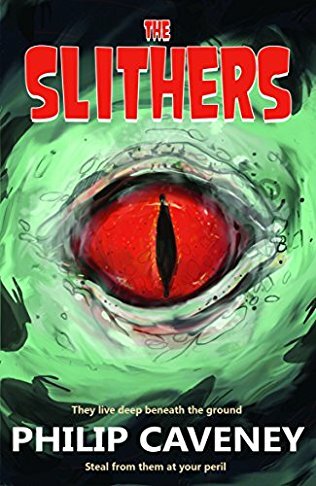 On a recent trip to Edinburgh, I tracked down a copy of his recent book "The Slithers" which is published by an independent Edinburgh publisher called Fledgling Press. This is the sixth, fully-fledged book, by this publisher excluding e-books. It certainly has one of the most memorable book covers which has been fantastically illustrated by Kylie Tesdale. The big red glowing eye helps you find it very easily on the bookshelves which is just what you want in a world full of books. Beyond the book cover, you'll find a fantastic story waiting to be unleashed by the reader. The story starts with Zach and his Dad's background history. It's a sad one, but for some people in this world, it might be a shared reality. The connection between the main characters, Zach and Pepper, is brilliantly written - it really helps to explain both of the characters past. The further you dip into the fantasy sweety jar the more the story unwraps itself. The chocolate coating soon dissolves into a genuine scary nightmare for both the characters and readers alike. Everyone should be able to relate to one or more of the characters in this book. There will be a character in this book with similar traits to yourself that you will be able to relate to, regardless of age. The fantastic mix of personalities brings out conflicting interests between the characters which will keep readers hooked. These include the feelings and inner personal workings of Grandad Alistair or Jerry, Beefy or even the funny misfortunes of Cheryl. Set in Scotland, the landscape is a big feature of the story. It is bleak and desolate which heightens the Gothic horror element of the story really well. Philip uses his surroundings, local tradition, Norse mythology, and a big dollop of reality to carve out his stories. It leaves little ripples of fantasy magic inside your fantasy brain. This book becomes a horror montage, at times, but it also provided an element of pleasure to read. It has a pacey plotline, no-nonsense character dialogue and just the right amount of ingredients to eat with your haggis on a Sunday afternoon. This has to be one of my favourite books by Philip Caveney. If I had read it last year, then it would have slithered into my top ten reads of the year. I loved every page of this book. It was very atmospheric, which gave it a great classical B movie feel. I loved the depiction of Scottish coastal village-life with a strange past and a great mind-blowing secret. I also loved the scenes that centered around the arcade and, subsequently, Tazer (the arcade owner), who has a delightful and very engaging end. This is a brilliant book, an effortless read and one that I would urgently recommend that you track down.